Who Let the Blogs Out? — Denv.Her. Hey, hey my beautiful denv.her. babes! Sorry to keep you waiting for another vent. I have about 5 new ones in the works and keep bouncing from one to the next without actually finishing one. I have full blown writer's ADD which honestly, is just as bad as writer's block because I'm not posting anything new. So excuse me while I get my excessive thoughts together. Anywho, I finished this one! Last week, I was watching a fellow blogger's Insta stories and I landed on several that were not so pleasant. This girl (let's call her Blogger Borris) was ranting and raving about new bloggers who are, and I quote, "ruining the blogging world." This rant was targeted at new bloggers who are using the hashtag: #ad on Instagram posts, that are not paid posts. Now let me give you some background here. In the blogger world, when a company reaches out & wants to work with you & you agree to partner with them, they will send you what is called a Social Media Kit. We've received Social Media Kits for paid posts (where the company is paying you to post content on your social media platforms), affiliate deals (where a code is provided to give your readers a discount and you receive money from each transaction made that uses your code), and sponsored product (where a company sends you free product). This Social Media Kit has v specific instructions on how you must promote the company and or product on social media. These instructions include when to post, how many times you must post, what your pictures need to look like and what hashtags to use. You must follow these instructions or the company has the right to take back their product and or payment. Why does Boris care so much about the #ad debacle? She's obviously not getting the monetary compensation she wants from certain companies when approached. Funny thing about Boris' rant? 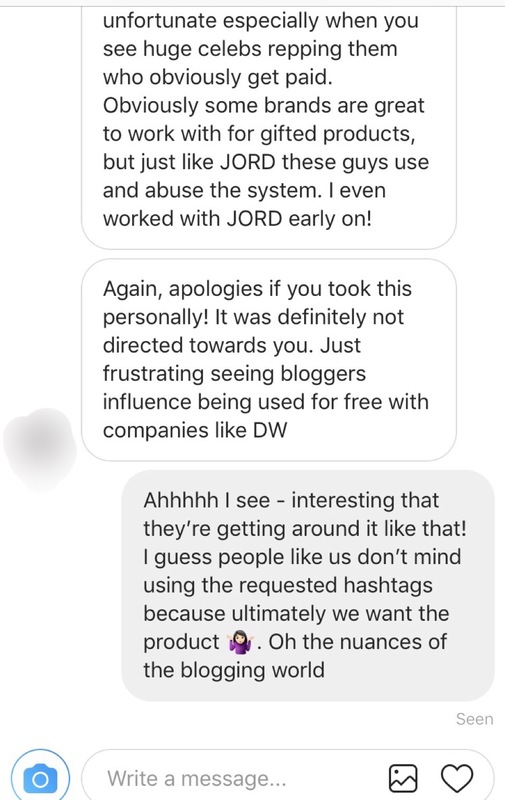 She's calling out bloggers for using #ad on un-paid posts but unbeknownst to her, companies are requesting the use of "#ad" even for product sponsored posts. How do we know? This just happened with our partnership with Daniel Wellington. They provided us with product and requested we use #ad in our posts. So guess what? We willingly did as we were asked and didn't think twice. In return, we received a beautiful DW watch. SO, Boris' rant coincidentally goes up right after we post a Daniel Wellington #ad. "WE KNOW THOSE COMPANIES ARE NOT PAYING YOU TO POST. DO NOT USE HASHTAG AD. YOU'RE RUINING THE BLOGGING WORLD, AND YOU DON'T EVEN KNOW IT! SOME OF US ARE TRYING TO GET PAID BY THESE COMPANIES!" Was the timing of her rant a coincidence? I think not. & do I ever let anyone get away with an unwarranted & unintelligent verbal attack? Nope. 1) Amused. Boris was wrong. Companies are requesting bloggers to put #ad on their social media content even if it's a product sponsored post. 2) Green. We've been running denv.her. for a little over a year now - but guess what? We still don't know what we're doing half the time! We're still learning & trying to figure this whole blogging thing out. We could 100% use the advice (and preferably some kind words) from a more tenured blogger. If it bothers Boris SO much that people are using the "wrong" hashtags (which is a ridiculous notion in itself), why not DM them? Reach out and help a fellow #bossbabe instead of tearing people down & coming off like a self righteous b*tch. ...but let me guess? I shouldn't use that hashtag either. ALSO, is there really a right and a wrong way to blog or use freaking hashtags? I don't think so. Blogging & social media are forms of personal expression - you can't really give personal expression a black and white label. If you're trying to label someone's way of blogging as correct or incorrect, that label is simply your opinion. So Boris, you may think you're the blogging expert, but that blogging crown you have so delusionally placed atop your head is merely a personal opinion of yourself. & I can confidently say that our opinion of you is quite different. Ultimately, all of us bloggers are at the mercy of the audience we're trying to capture and the companies we want to partner with - and if they want us to use #ad for a sponsored product post, we're going to do it. We're not in the blogging world solely to chase monetary gain - it's painfully evident you are. Maybe you shouldn't have quit that day job? 3) Shocked. Boris is a phony. Boris' hateful rant took me by surprise because she has created a "blogging company" for influencers that she markets as a "new kind of blogging community" that provides resources and a FRIENDLY networking environment to, get this, SUPPORT NEW BLOGGERS. Like.....is this a joke lol, lol? SO, Boris is trying to sell a company of bloggers supporting bloggers but is PUBLICLY RIDICULING AND OSTRACIZING new bloggers for not knowing what they're doing. You are one funny gal Boris & a v bad business woman. Boris is a prime example of why people would be deterred from starting a blog. EDUCATE WITHOUT BELITTLING. Guys. This is back tracking if I ever saw it. Boris was caught and she knew it. She is V well aware of these vents sessions and that I love me some screenshots. So let's talk about her comment of "don't feel personally victimized" after personally victimizing someone lol. Like UGH Boris. I'm sure some of you could see the convo above and think, well maybe it was just a coincidence. Maybe Boris isn't lying! I would have liked to think that same thing; but fast forward to last week where there was a social media influencer event - denv.her. was in attendance and (dun, dun, dun) so was Boris. If Boris had a genuine bone in her body, she would have seen us at this event, immediately come up, apologized for the confusion and chatted with us. I knew Boris before starting denv.her. and we were always friendly. Did Boris say hello at this event? Of course not. She didn't even acknowledge us much less speak to us - take from that what you will. The influencer event solidified in our minds that Boris is a pretender - a pretender attempting to build a blog and a company on false values that she can't even hold herself to. My advice for people like Boris? Just own your sucky personality instead of being fake. You want to publicly humiliate other bloggers for NO reason, & then try to hide behind a nice girl persona? PUH-lease. Let me show you to the door Boris. & behind that door? One well-deserved vent sesh. Disclaimer: I sincerely hope Boris doesn't feel personally victimized by this post.